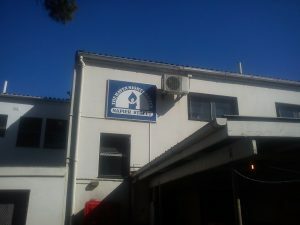 Following on from mentions in our ‘Incubator 1‘ and ‘Incubator 2‘ installments – Jenny (JMA) and Lisa Millbacher (Bespoke Bathrooms) met with Jerry Louw and Hassan Khan – Respectively, Manager and CEO of the Green Point Haven Shelter – to determine and discuss a way forward and how we will be of assistance. We have measured up the facility, made notes and taken numerous photographs. To further our investigation and understanding we visited the Haven Shelter in Retreat – which is their ‘benchmark’ shelter (because it was designed specifically as a shelter as opposed many of the facilities in Cape Town where buildings with various previous functions have been appropriated to accommodate a shelter) The main difference is that in Retreat there are separate rooms (accommodating 4-6 people) with en-suites as opposed to the large dormitories with big shared bathrooms Green Point offers. It was interesting to study the Retreat shelter as a model but in fact we realised that the one in Green Point operates very successfully and with a few design interventions we could improve the service dramatically. Kitchen / Scullery require a full redesign and careful approach. This would need to be re-organised for practicality. This area is cluttered, requires new suitable floor finish & re-grout. External Area outside Kitchen is completely hazardous. Thought to be given around how one would design around how deliveries could be made effortless. Cleaning and maintenance in the area should be easier. Use of water in maintenance should be reduced considerably. Bins need to be covered (roof / shading device) and not left in sun. Gas tanks in the area to be reconsidered. Resurface. Fire safety (Hazardous), fire escape routes at recreation area, etc. to be considered. JMA can assist with the technical details. Recreational Area requires covering. This could be done using shade cloth. JMA to propose alternatives. Planting in the area to be improved. Could service Kitchen. Washing line / wash area to be considered.